This guest blog has been kindly written for us by Paul Humphreys, Founder and CEO at StudentCrowd and Member of the Higher Education Commission. To find out more about what StudentCrowd do, see Student Reviews, Recruitment and Retention published by HEPI in July 2018. 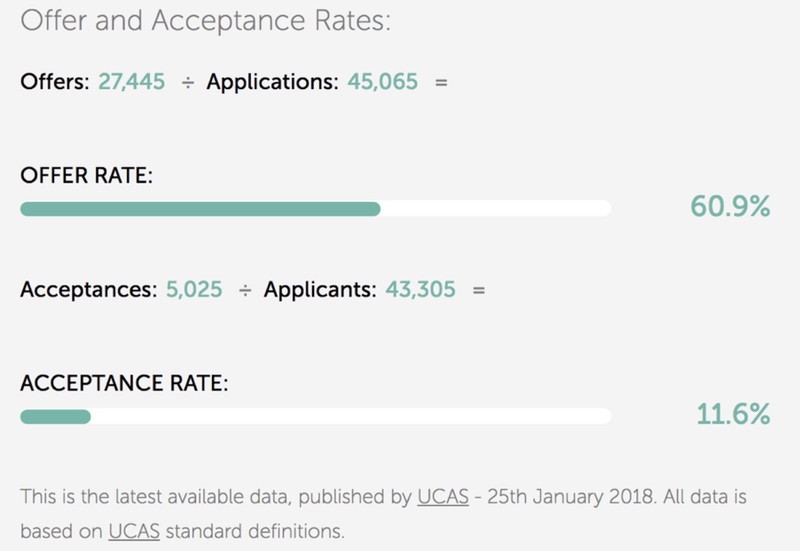 In higher education, the “Acceptance Rate” is the number of placed students at an institution divided by the number of applicants. It is usually expressed as a percentage. So a university with 3,000 placed students and 10,000 applicants would have an acceptance rate of 30%. 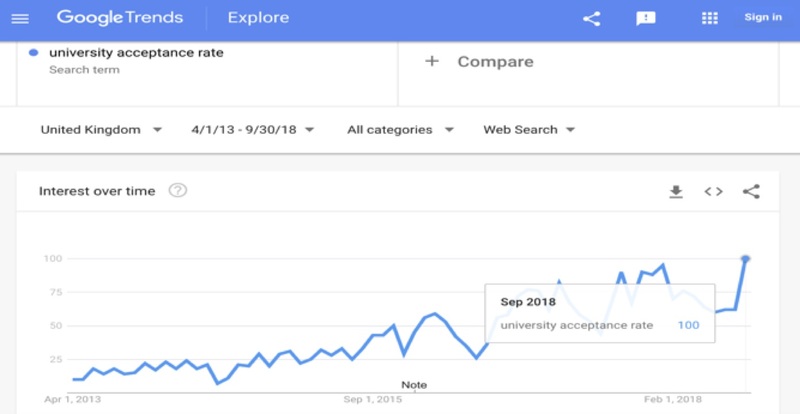 We stumbled across a huge upward trend in searches for “university acceptance rates” when we found our website at the top of Google searches. It is a big responsibility supplying accurate data to prospective applicants – especially when Google Trends data Reveal searches for “University Acceptance Rate” have grown by 714% in the last five years in the UK. This is odd because accurate up-to-date acceptance data are made available by UCAS. Last week, we published a list of university acceptance rates on our own website to provide prospective applicants with the information they are looking for. The #1 highest acceptance rate is Bishop Grosseteste University. In June 2017 there were 1,370 applicants to Bishop Grosseteste University. 590 students accepted their offer which results in a 43.07% applicant acceptance rate. The #25 highest acceptance rate is Solent University. In June 2017 there were 9,100 applicants to Solent University. 2,175 students accepted their offer which results in a 23.90% applicant acceptance rate. The #50 highest acceptance rate is Liverpool John Moores University. In June 2017 there were 26,485 applicants to Liverpool John Moores University. 5,230 students accepted their offer which results in a 19.75% applicant acceptance rate. We were keen to discover why so many prospective students search for acceptance rates, so we asked our users via a poll on StudentCrowd. We received 1,812 responses between 20 September 2018 and 24 October 2018. The raw text responses were illuminating. There were three main areas. Students who are applying want to have at least one university to which they are sure they could get into. The uncertainty of the future otherwise causes stress and fear of not being accepted. They think others are much better than them. Because A levels are harder and more people are worried about achieving their target grades. Because why apply if you’re most likely going to be rejected. So a prospective student does not pin all his / her hopes on one uni and instead applies to more universities to be on the safe side. High acceptance rates show other applicants had a positive experience at the university. You want to go to a university that is popular with students. Students want to know other students have been happy. high acceptance rates mean the university is not competitive and degree may not be worth the effort once in the job market. People want to go to a school with a low acceptance rate because they believe that is a good school. One important insight is that many prospective students did not actually refer to the acceptance rate in their comments. They were more interested in the offer rate, which is the total number of offers made divided by the total number of applications. This ends up with a different – and higher – number. For example, at the University of Manchester, the offer rate is 61% but the acceptance rate is 12%. This makes sense because it suggests people are trying to keep their options open for as long as possible. Yet Google data show they rarely search for “university offer rate”. Very roughly, there is just one for “university offer rate” for every 19 searches for “university acceptance rate”. We are aiming to combat this misunderstanding by adding the information in a clear form to the university profiles on StudentCrowd. As our main aim is to help students make the best decisions, do let us know if we can improve on how we are handling acceptance and offer rates in the comments below. That’s interesting. The data has the potential to confuse how many students are made an offer, and how many take them up. There have been quirks in the UK’s overall data as the two most selective universities have not received the largest number of applications – even after controlling for size.